The normal foil printer I use in NYC prints on a windmill without guides. They’ve typically printing using the gripper with ‘commercial register’, and that doesn’t interface with the stuff we are doing… Register is dead on across 6-8 colors, and the foiling we got from this vendor was off in a ‘whirl’ pattern that is consistent with this style of commercial reg, no-gauge/guides printing. I asked him if he knew to use the guides, and that fell upon technically def ears SO…. 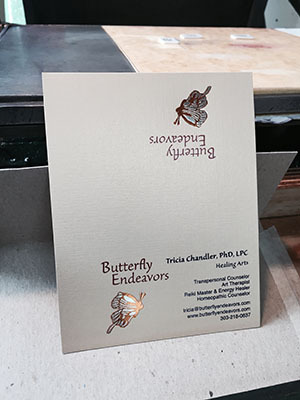 Trying to find foil stampers with reasonable quality who are approachable from the perspective of another printer, who can run jobs on site (no ex-site work), are willing to allow for a press-check, and willing to interface with someone else who is directing a project the scope of which is outside just foiling. There’s a lot of work coming down the pipe for combo-media printing from one of my bigger customers, and I need someone I can build a relationship with. I’ve had excellent experience with Holigraphics. I would be more than happy to work with you. I have a 10 x 15 windmill set up with side to side foil pull and much experience running tight register foils and foil with register emboss but I am located in Colorado. My overhead is low so I can usually give excellent pricing. I must also say that I handle most press proofs via overnight FedEx with good results. Also possible with high quality photos in near real time via internet.